I hope I’ll be forgiven a rather longer and more personal post this month. For most of the year I seem to have been moaning about the difficulties of being a historical writer, and as the family time of Christmas looms closer it occurs to me there’s something even worse. My own husband, Paul, is a hero for doing it. When he found me wandering about with a rucksack of rocks on my back and I explained I wanted to know what a 17th century hunchback felt like, he only said ‘Uh-huh,’ and went to make the tea. When he caught me crying over my computer because a young sergeant had died in the Charge of the Light Brigade, he gave me a hug. When I was trying to master 17th century rapier work and made a hole in the ceiling, he just fetched a ladder and started to mend it. He’s not perfect. He used to help me work out fencing movements, but stopped when I was writing ‘Honour and the Sword’ and asked him to stand a little lower so I could see if I could feasibly knee him in the balls. But I’d still say he’s a hero for putting up with me, and would guess there are many others making similar sacrifices every day. The hardest thing, I think, is having to deal with the disengagement. The reality of cohabiting with a historical writer is that you’re living with someone who’s only half in the same world. "I was so absorbed in my work this morning that I forgot my name! When I went to the parlour for coffee, I looked at the list to tick off my name and was puzzled that I could not find it. I was looking for ‘Wilberforce’!" I can identify with this, but I also know how irritating it is to live with. 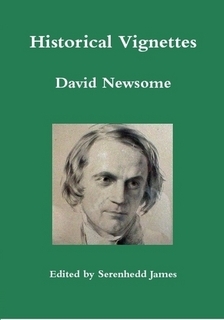 I know, because the historian’s name was David Newsome, and he was my father. It is a strange thing to read your own father’s diaries, but I’m his Literary Executor and it’s part of my job. My sister Janet and I have just published some of his early lectures and articles, and the process was strangely humbling. I’d read his books, of course, but he was still 'my dad', and I’d never quite taken in what a giant he was in his own world. 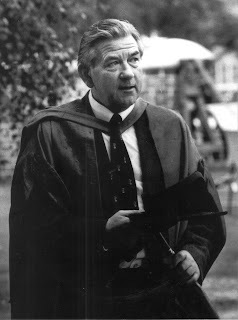 Academic histories don’t attract big sales figures, and although he won the Whitbread Best Biography in 1980, I hadn’t fully appreciated what that meant. It was only when I read the quotation from A.N. Wilson we chose for our back cover that I had my first real glimpse of the truth: ‘The most engagingly readable, the most sympathetic, the most intelligent historian of the nineteenth century’. I’d kill for a review like that. But at the time I often found his absorption with history an irritation. We had a father who knew Cardinal Newman died on the 11th of August, but struggled to remember our birthdays. And he had always been like that. When he was doing an Officer Initiative Test on National Service, the sergeant-major apparently caught him deep in conversation about some abstruse mediaeval philosophy, said just ‘Gawd!’, and passed on. My father used to relate this anecdote with great delight, but I confess my sympathies were often with the sergeant-major. And perhaps I was wrong. I’d bet I’m not the only one feeling a pang of recognition at that. When I was struggling with a passage on 17th century torture and a telephone caller identified himself as ‘British Gas’, I can still remember the agonizing seconds of silence while my brain was thinking ‘What?? ?’ I was in a world where there was no such thing, no such concept, no such reality at all. In case it isn’t screamingly obvious, by the way, I absolutely adored my father. But there’s a danger in it. When we live in the hinterland, there is always a risk of the boundaries between worlds becoming blurred. Domestic priorities rub shoulders with historical ones, and we see nothing wrong in the juxtaposition of the two. One of my dad’s diary entries devotes as much space to the day’s discussions with his students (one on Hildebrand, one on Plato) as it does to the domestic upheaval accompanying my own birth. It’s only a problem when the two worlds overlap in our minds, and a) and b) lose their distinction. It’s at night we’re most vulnerable. We’re thinking over our current writing, but the real world intervenes to create a surreal blend of the two. My dad had long been mulling over the relative merits of Cardinals Newman and Manning, and when he was a Cambridge don this manifested itself in a dream in which Newman scored a First Class degree and Manning a lowly Third. I’ve had similar experiences. When I was writing ‘In the Name of the King’ I was wrestling with the story question of how my hero could track down the villain who had ruined and humiliated him, and somewhere in my sleep I rejoiced to find the answer. It was only when I woke that it occurred to me it was unlikely a 17th century nobleman would have had access to Google Search. I’ll never be in my father’s league as a writer, but I’ve inherited the irritating bits and at last I understand them. A historical writer stands with a foot in each of two worlds – and is always in imminent danger of doing the splits. I was never sufficiently sympathetic to my father, who died long before I published my own first book, but I wish I could go back now and tell him I understand. I am so very grateful that my husband does. Which is why finally this post isn’t dedicated to my dad, but to Paul and all his fellow sufferers. To the poor partners, siblings and children of other History Girls, to the History-Widowers and History-Orphans who have to live with someone who spends half their time in a different century. We’ll all have our own stories about this, and I do hope some of the other History Girls will share theirs. I so relate to this - and the mood swings, too: unrelated to anything going on in the real world, all to do with what's going on the writing (and HOW the writing is going) so one's poor spouse comes home to snarly, grumpy, don't-want-to-talk-about-it-leave-me-alone - and mine too is remarkably tolerant of the whole thing. This blog sang on so many levels, Louise. The double life, and very poignantly of the loss of a parent before your own work began. I sometimes find myself almost (not always almost) in tears at the kitchen sink, rather selfishly wishing I could see my mother with a copy of Blood Red Horse in her hand. She died before I even thought of writing it. Apropos the double life, my son, aged 10 or so, asked why, if I needed to spend so much time with Richard the Lionheart, he couldn't come to tea. What a lovely tribute to your dad and honest acknowledgment of the debt we owe to our families - although it was my husband who dragged me down into the Cistern in Istanbul. And you met my dad! The odd thing is I never really saw him in his academic setting, so I envy you that. He'll have been very pompous (bless him, but hopefully entertaining as well. This is a most moving and lovely post and makes me miss MY dad who was very young (62) when he died and who never knew I was going to be a writer. The thing that really made me shiver was your father's handwriting which was so like my own father's. Quite, quite spooky! But a really super post, Louise. Katherine - Of course, the mood swings! That's absolutely the worst thing, and I can't believe I forgot to mention it. Snarly-grumpy is spot-on right too. Thank you for completing the picture! Katie - Yes. That's it exactly. It was the same here, and I never even thought of writing until after both my parents had died. That yearning to share our achievements never quite loses its grip, does it? Thank you so much for sharing this - that image of your mother holding a copy of your book in her hand is going to haunt me for a long time. Adele - That's so awful. 62 is tragically young, and it must have been a dreadful thing for you to deal with. I found your post very moving and true. Ditto Katherine's comment, above. Thank you. I'm almost afraid to show this post to my husband, Louise - he'd be nodding his head in emphatic agreement and asking me when he could take yours for a pint. What a lovely, moving tribute to your father - you had me tearing up. A reply on behalf on all those on the other side. I found this very touching. Not just as the husband of a history girl, which makes it all seems very familiar, but I also enjoyed the admiration for a generation now gone. the sentence in a minute that I would never be able to do if I had a year. honour to be in your lives. inspecting a very nice Lamb of God, a mysterious black coffin and a dozen reliquaries at the Frari Church, where the poor guard was also interrogated about the shape of the steps going up to the bell-tower. Your post brought tears to my eyes and made me wish I had known my own father. What a wonderfully touching, bell-ringing and funny post (I love 'in imminent danger of doing the splits' especially!). Thank you so much, Louise. My husband's oft-repeated question to me 'Are you with us?' ('us' being him and the children) reminds me how many times I am with them in body but with glazed eyes and a mind elsewhere. They all put up with a great deal. My worst sin was poor concealment of my excitement when he was made redundant, poor thing, since this meant he could look after our youngest child (then 2) while I wrote (a book I was desperate to work on, which became 'VIII'). That's worse than the kneeing or the tent peg. By miles. Re previous posts and in particular Graham's POV + Rebecca's husband's suggestion of the Partners Going For A Pint - should we suggest they form some sort of Association? They could have meetings and a help line to phone if in imminent danger of being maimed by a medieval instrument. Any ideas for a suitable name? Thank you so much, Linda and Becky - but I think some of the comments here are a lot more moving than the original post! Graham - Your comment is so beautifully written I wish we'd had it as a Guest Blog-Post of its own. Michelle is a very lucky History Girl - but then you already know you're lucky too. It must be quite magical to live in the circle with someone who has an imagination like hers. Anonymous #2 - You take the prize today. You wrote ONE sentence, and brought the tears to my eyes. Thank you for sharing, and I only hope my post didn't evoke anything too painful. Harriet - Yes, yes, yes! The 'glazed look' is exactly what Paul complains about. It's the 'top brain' in this century, 'bottom layer' in another. Theresa - what a brilliant idea. I'd suggest the 'H(a)G-ridden', but it's rather unwieldy. I doubt any of us would mind what it's really called, as long as it's not 'the Resistance'. Fantastic Louise! You brought back some lovely happy memories of our father. He inspired us in so many ways, not least with a love for times gone by - I still listen to music from the Edwardian era! This is, of course, another possible aspect of living with an historian - what other 10 year-olds would have been glued to 'The Forsyte Saga' on TV? ...and, of course, it was he who took us to see 'Zulu' and sowed the seeds for a life-long love, not only of the film but of history itself. This was just the most perfect post for a Sunday evening when one is in any case feeling introspective. My father too never knew I'd ever write a book and my mother held my first one in her hands,then died 6 months later. As to the long-suffering husbands! I feel immensely guilty and selfish for living so much in my own head... which made your tribute Graham so much more touching. Thank you! And thank you Louisa... you touched a nerve here. Hello, Jan! And you're right - thank you for reminding me of the good things about living with a historian too. Something else I remembered was that it was he who took us to see 'The Charge of the Light Brigade', when I'd have been about 9. We were far too young to see Cardigan frolicking in a corset, but something must have stuck for me to be writing about it all these years later... The Charge, I mean, not the corset. Dianne - thank you so much. It's sad to see so many of us in the same position, with parents who died before we ever published our first books. I wonder if historical fiction writers tend to start later in life than those who write contemporary? God, all so true. Ned puts up with me completely ignoring him when I'm writing. He sometimes emails me from the other end of the flat. That said, I remember apologising for not being in the room mentally one time, and he said, 'at least you always have interesting things to talk about when you come back. I'm just glad you're not an accountant. What if you wanted to talk to me about tax law?' That made me feel better. He and a couple of other of the partners of writer friends of mine refer to themselves as 'HaBs' - husbands and boyfriends. Apparently when they talk it's normally not to complain, but just to sympathise about seeing your beloved writer go through all the emotional trauma they inflict on their characters. Great post. My husband dragged me ALL ROUND Glasgow looking at bridges, trying to find the bridge that featured in Brond until I was exhausted. And I never even got to see the freaking bridge. A LITTLE LIGHT RESEARCH By Adèle Geras.